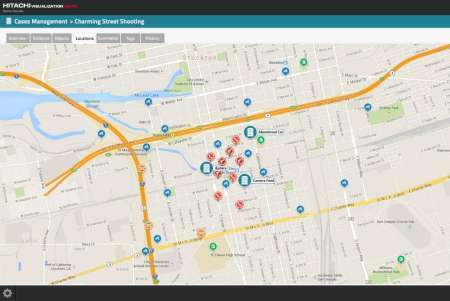 Police departments now have the ability to view potential suspects’ activities on a map that’s integrated with social media accounts and public records in real time or close to it, thanks to new visualization and analytics technologies. Just like an episode of CSI, law enforcement agencies would be able to pull up a screen that displays a map of the city. Police can then play back a period of time in which social media posts and cellphone activities of suspects, as well as police records, appear on the map at the locations in which they occurred, at the time they occurred. It may sound like a Hollywood thriller, but thanks to new capabilities developed by Hitachi as part of its Visualization Suite, being able to tell the story of a crime that recently happened or is about to happen just got very real. Hitachi’s technology saves time for police officers and cuts down on data silos by putting relevant information all in one place and allowing analysts to access it on one screen. “We do all the handiwork on the back side so it’s easy on the front side,” Jensen said. Hitachi used the example of a potential terrorist cell targeting an event for an attack. Hitachi’s system can take a number of suspects and create a timeline of their behaviors to pinpoint suspicious actions. Law enforcement can use this information to figure out how to stop the attack from happening or arrest the suspects at the moment of the crime. Law enforcement can also deploy units to the areas in which they’re most needed. Hitachi Visualization capabilities enable evidence and event data to be displayed geospatially, and overlays other event sources and data, such as social media postings. The ability to visualize the crime being planned and carried out can help law enforcement argue their case in court in front of a jury that might not be as inclined to understand the technical activity going on behind the scenes, according to Jensen. Hitachi collaborates with law enforcement agencies to ensure that all of the data collected in the course of a criminal investigation is stored correctly as evidence throughout the legal process. Because this data is stored, police officers can go back to it if they find connections to new cases. Hitachi said that its knowledge of the rules of law enforcement make it an attractive system for partners to work with. When new methods of data analytics become available, they can easily be added to enhance Hitachi’s mapping system. “We want to encourage [Hitachi] to become the core platform…that other people can integrate with,” said Christian Heiter, chief technology officer of engineering at Hitachi Data Systems Federal. A live Hitachi Visualization Suite demonstration will be held Tuesday, March 7, at the Newseum in Washington, D.C., during MeriTalk and Hitachi Data Systems Federal’s “Connected Intelligence – Next Generation Law Enforcement Capabilities” event. Eventually, Hitachi wants the platform to be scalable enough to accumulate tens of thousands of sensors and cameras for law enforcement use, according to Heiter. But citizens need not worry about privacy—a pizza delivery app still collects more data on users than Hitachi’s geolocation system, according to Jensen. The police can only access information in the public domain, such as social media accounts and public records. In order to access call information or phone location information, police need to obtain court documents that authorize them to do so. This ensures that law enforcement doesn’t collect information that’s irrelevant to a crime. “Honestly, these types of systems enforce privacy,” Jensen said. Jensen, whose background is in law enforcement, said there are still ways to determine an individual’s location without accessing phone records. Social media sites such as Facebook and Twitter often document the locations of users when they post online.